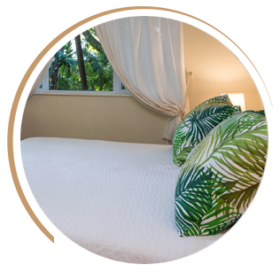 Our high-class spacious cottages are well-equipped with luxurious linen and beautiful furnishings. Wifi access is available throughout. A baby feeding chair and cot are available on request, as well as extra stretcher beds. A fully equipped kitchen in five of the cottages allows you to make your own meals. Each room has a kettle and microwave for making refreshments. Each of our units has its own enclosed parking space and ample safe street parking is also available. In the summer season, cool off in the saltwater swimming pool and maybe enjoy some reading in the shade of the plane tree. 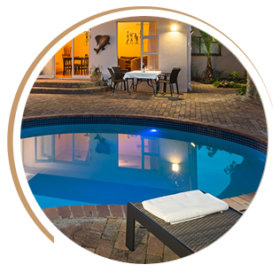 We also offer a laundry service, an iron and ironing board on request, and we provide towels for use at the pool. If you speak German, you are welcome to request Deukom (German television) and listen to shows in your own language. No South African holiday is complete without a “braai” (barbecue), so grab the tools and enjoy a delicious meal with your family and friends. Various activities in the surrounding area include fine dining and wine tasting in the vineyards, mountain biking, hiking, enjoying the beach, golf courses and more. We are happy to help you organise the booking of your activities and tours, as well as a shuttle service to and from the airport.